A fuel leak and crack on the space shuttle Discovery's huge external tank has forced NASA to call off any attempts to launch before Nov. 30 – the latest in a series of delays for the spacecraft's final voyage. This storyhas been updated at 4:15 p.m. EST. NASA's latest launch delay for the space shuttle Discovery couldpush the spacecraft's final mission into the Christmas holiday, or even postponeit completely until February, agency officials said Wednesday. Top shuttle program managers met today (Nov. 24) to review recentrepairs to Discovery's massive external fuel tank. Based on the discussion,NASA officials decided to forgo any launch attempts until at least Dec. 17, ifnot into the next launch window in February. "What we've told the agency leadership is that clearlywe're not ready for the Dec. 3 to Dec. 7 window that's coming up next week,"John Shannon, NASA's shuttle program manager, said in a news conference thisafternoon. "We'll leave the option open for a launch window for Dec. 17,but a lot of data has to come together to support that." A mid-December launch would push Discovery's planned 11-dayspaceflight into the Christmas holiday, something NASA has typically worked toavoid. The agency tries to not schedule any shuttle flights over the Christmasand New Year's holidays, because shuttles in orbit during the year change wouldneed a flight computer reconfiguration, shuttle managers have said. If NASA is unable to launch Discovery in December, the next clear chance to do so would come in February. Shannon added that the engineering teams are concernedprimarily with understanding the issues and evaluating the risks, and are lessconcerned with setting any definite launch dates. "We want to make sure we fully understand the problembefore we fully commit to go fly," Shannon said. 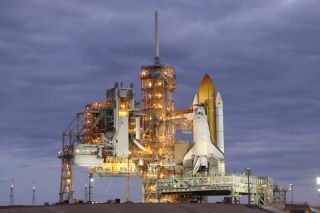 Discovery's STS-133 mission will be the shuttle's39th and final flight, before it is retired along with the rest of NASA'sorbiter fleet in 2011. The finalflight of Discovery has already been delayed by over a month due to technicaland weather-related issues. As it stands, the mid-December launch window openson Dec. 17 and runs through Dec. 20. A Dec. 17 launch, if approved, wouldoccur at 8:51 p.m. EST (0151 Dec. 18 GMT), NASA officials said. Most recently, Discovery was slated to launch with asix-astronaut crew on Dec. 3 at 2:52 a.m. EST (0753 GMT) from a seaside launchpad at NASA's Kennedy Space Center in Cape Canaveral, Fla. The shuttle'splanned 11-day mission will deliver a storage room and Robonaut 2, a humanoid robot, to the International Space Station. Two spacewalks are alsoplanned. In the last week, engineers completed work to plug apotentially dangerous hydrogen gas leak and reinforce cracked metal ribs onDiscovery's huge external tank. Still, shuttle program managers did not feelthey had a firm enough grasp of how the problem originated in order to proceed with alaunch attempt next week. Two cracks each were found on two metal ribs around theupper middle portion of Discovery's external tank. On Friday (Nov. 19), shuttletechnicians installed new sections of double-thick metal to replace the crackedareas. A separate crack in the exterior foam insulation onDiscovery's fuel tank was also repaired, NASA officials said. "Even though the problem may be fixed, you make sure,generically, that you're not exposed to that same risk anywhere else,"Shannon said. "We need to nail down our risk exposure to this." If NASA is unable to make the mid-December launch window,Discovery's STS-133 mission could be pushed into late February, when the nextwindow opens up. Teams at Kennedy Space Center have been hard at work since Discovery'slaunch was originally scrubbed on Nov. 5. Workers have been given Thursday and Friday off ? for theThanksgiving holiday in the United States ? with work expected to resume onSaturday. Managers will meet again on Dec. 2 to assess progress towardthe Dec. 17 launch opportunity. You can follow SPACE.com Staff Writer Denise Chow on Twitter@denisechow.